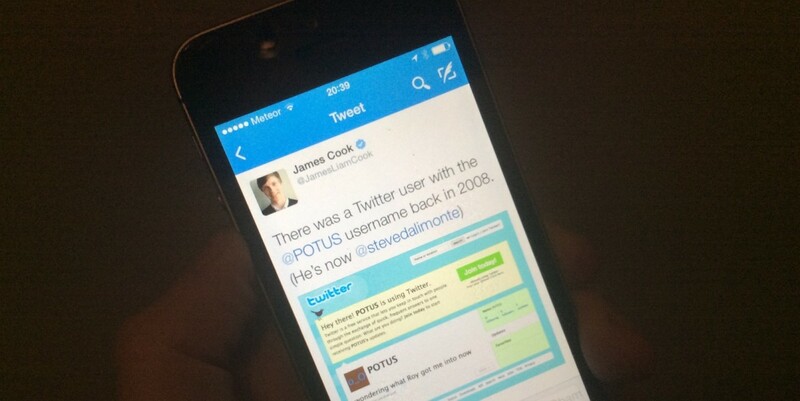 President Obama began tweeting as @POTUS today, but he’s not the first person to use that name on Twitter. That honor goes to Toronto-based Steve D’Alimonte, program director a youth-media/violence prevention organization and freelance video producer. You're welcome for the handle @POTUS. I accept green cards as thank you gifts. The story is that back in 2008 when I was living in Toronto, a friend of mine (Roy) told me about this new social media site Twitter. Obviously I had no idea what would become of the social network, so signed up without giving it too much thought. I was pretty big into the show ‘The West Wing’ at the time, hence the name POTUS. Fast forward to 2011 and I moved to the US on a work visa with my wife and by this point Twitter was huge. While looking for work in the US – first in Seattle and then the Bay Area – I figured I should probably use a handle that was easier for potential employers to identify as me. I had the thought that one day someone might come asking about the @POTUS handle so I tried to register it to another address I had, but I wasn’t able to. I quickly gave up on it and hadn’t really thought much about it, until today. Clearly, I should’ve tried harder to maintain the handle! Don’t worry Steve, you’ll always be the President of Twitter to me.